Enjoy Utah! is your source for all things Valentines! 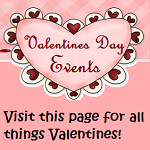 Below is a list of Valentines activities and events. If you know of one we may have missed, email us at contact@enjoyutah.org. Make sure to check this page often, as the list of events and activities is sure to grow! Valentines' Day With Your Sweetheart For $50 or Less! Click on the title to watch my segment on KUTV 2's Fresh Living on Tuesday, January 31st for some great ideas! Watch the segment HERE. This movie comes out on February 10th, and is a perfect Valentines date movie! "On Valentines' Day, Show Your Love On A Budget"
February 7th - 14th 2012 is Marriage Week. Many activities and events are planned throughout the state. One of my favorite books, it has been made into a movie! You can find more information about the book and movie in the link above. A playlist of some of the greatest love songs. A collection of some of our favorite children's valentine and love stories. Michael's craftstore has many valentines crafts during the month of February, most of them free! Send your loved ones a FREE personalized valentine greeting! Valentines Day Craft Workshop (Jan. 26th).